Guide to understanding what "Natural Light" Photography sometimes really means! Many couples planning their weddings and searching for wedding photographers will tend to say, they are looking for a natural light wedding photographer. The question is do they truly understand natural light photography vs. artificial light wedding photography. Natural Light photography can be described as photography taken in the light available to a photographer at a given location at a given time. Natural light is wonderful if you're a photographer that truly understands lighting and knows how to use it. The other component is having a high performance camera and lenses suited to creating sharp properly exposed images in low light conditions. Light in simpler terms is energy that travels in a straight line and has varying intensities based on its distance, size and how it is getting to the subject that is being photographed. Many photographers who aren't very skilled or haven't yet been able to invest in lighting equipment will advertise as natural light wedding photographers. Unfortunately, the message they are unintentionally sending is that they don't know or understand how artificial lighting works. It's not always a bad thing since most are just starting out and learning while making a little money to invest in lighting in the future. The problem is when they accept a wedding anxious to build their portfolio and the lighting during the ceremony or reception is dim or non existent. Many of these photographers will only photograph in open shade or places where there is indirect sunlight and rely on the ISO (Sensor or Film sensitivity) of a camera in order to try and deal with the lack of light. If they don't have a high end professional camera or the right lenses, this is where they create severe disappointment. Your disappointment! Unfortunately, the couples seeking a wedding photographer and sometimes while on a budget will be attracted to someone advertising themselves as “Natural Light Wedding Photographers”. This can present serious issues if you or the photographer don't know the kind of lighting you will be dealing with during a reception at a venue at night with dim lighting or even an outdoor wedding with little or no ambient lighting. How does a “Natural Light” wedding photographer create images with little light? Light is everything for photography, without light, images cannot be captured. Just like the human eye, we need light to see. Many of us have had to look for keys, or a phone in a dark room at night and what do we typically do? We get a light source such as a flashlight or flip a switch. The same applies to wedding photography. The difference is the photographer has to understand and know how to use light properly to create an image, and as well should know what isn't seen can be as interesting as what is seen. The ability to work with various lighting proficiently and at any time of the day, whether in shade or in direct harsh sunlight is what differentiates, a professional photographer from someone that stays within a comfort zone of natural light photography, yet requires the light to be flat such as in open shade. This will quickly become evident when you ask to schedule an engagement session and they only suggest early in the morning or late in the day when the sun is setting. This is the point where you should come to the realization that the photographer you may be working with isn't well educated and knowledgeable in lighting, which is the main component and most important in photography. As a professional wedding photographer, my studies and training involved more than just posing, composition, and proper exposure. The study of light, how it moves, how it falls on a subject, the different types of light and light sources is what took the most time and effort to learn. Understanding the larger the light source compared to the relative size of the subject, the softer shadows will be. Understanding that a subject lit by window light can be back lit by reflecting light using a reflector behind the subject will reduce a shadow or using a black flag which absorbs light energy will increase the shadow. These are all things many claiming to be a “Natural Light Wedding Photographer”, do not understand or can put into practical use during a wedding day. I love natural light and I use it to create beautiful images all the time, but I use accessory lighting to help enhance natural light or I use tools to control and direct it to create an image with depth and interest or to highlight a part of a subject I want to stand out. This is what defines a true professional photographer. Lighting during a dimly lit reception is also a challenge for a "Natural Light" wedding photographer as they will likely place a flash on their camera and attempt to bounce light on dark colored ceilings or ceilings that are to high to effectively bounce light. Producing shadows under the eyes, on walls or other guests which isn't flattering in an image. These are the challenges that new photographers face, especially when they haven't had the opportunity or don't take the initiative to study lighting. 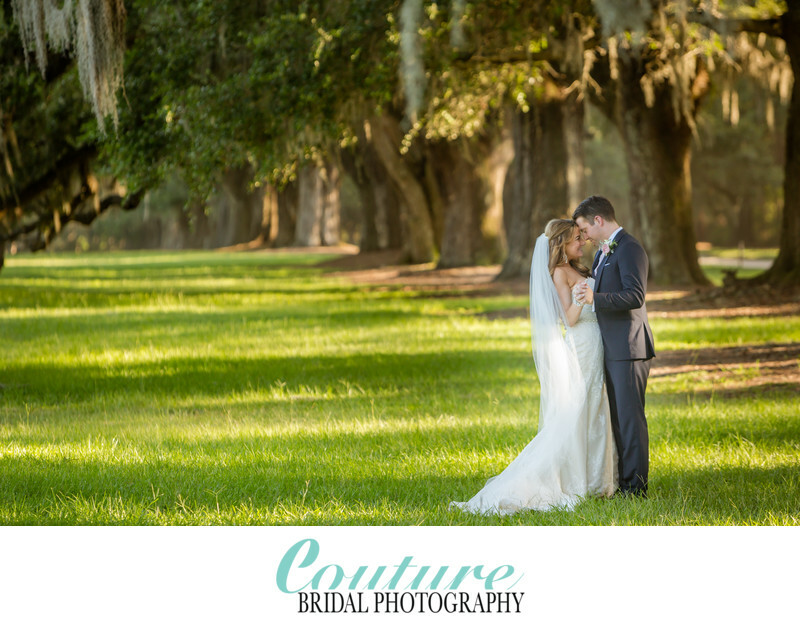 I am not only a professional South Florida and Destination wedding photographer that a couple hires to capture their wedding day with beautiful and artistic photographs. I am an advocate for my clients and potential clients so they receive the best wedding photography and manage their expectations accordingly. My role is also to educate and assist potential couples so they not only find the best wedding photography, but have the best wedding photography experience. The practice of educating and informing our clients is one of the many reasons Couture Bridal Photography, is known as South Florida's best Boutique Wedding Photography Studio. We provide the best wedding photography and make each client an important part of their wedding photography experience.